Wikipedians (or Wikimedians) in Residence are Wikimedians who dedicate time to working in-house at an organization. Wikipedians in Residence are usually financially compensated by the institution or by a Wikimedia chapter, but they may also be volunteers. The Wikipedian in Residence is not simply an in-house editor: the role is fundamentally about enabling the host organisation and its members to continue a productive relationship with the encyclopedia and its community after the Residency is finished. 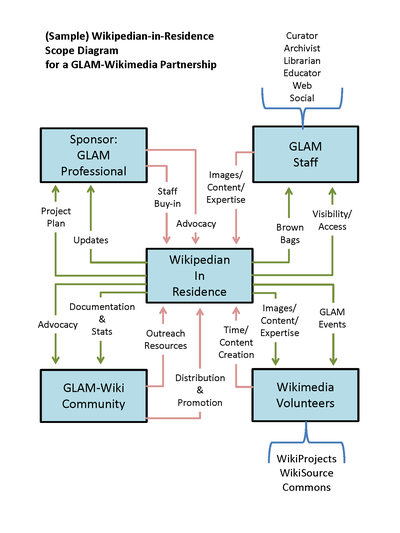 The Wikipedian in Residence model was first piloted by the GLAM initiative, but has since been adopted by other types of organizations. Are you considering if a residency is right for your institution? Check out the case studies or read on. Serves as a liaison between the organization and the Wikimedia community to promote a mutually beneficial cooperation. Promotes understanding of Wikimedia among staff at the organization through workshops and events. Works with organizational staff to digitize, compile, and organize resources that can be shared with the Wikipedia community. Facilitates the improvement of content by the Wikipedia community, rather than directly editing articles as a core goal. Coordinates events, such as Hack-a-Thons, Edit-a-Thons, or Backstage Passes, that bring Wikipedians on-site to work with staff on content creation and improvement. Formally coordinated by the institution, allowing the resident to work closely with staff for various projects. Ultimately, a residency lays the foundation for a more lasting partnership between the Wikipedia community and an organization. Teaching about Wikipedia practices and values, etc. The best way to locate a potential Wikipedian in Residence is to connect with your local Wikimedia chapter (if one exists) and/or via the talk page of an appropriate WikiProject on Wikipedia. Often these can be found through WikiProjects associated with your city, state, province, or country. Check the WikiProject Geographical Directory to get started. You can also contact us or send an email to glam wikimedia.org. On-site attendance, "in residence" means being physically based in the organisation for all or part of the time; and being seen as a member of the staff team, not a visitor. Working for mutual benefit while upholding the policies of both the institution and Wikimedia. Enabling of community interaction in both directions. Avoiding conflict of interest, especially when editing articles about the institution itself. Teaching ability - to GLAM professionals about Wikimedia and vice versa. Charisma to encourage a group of volunteers to support the project. Presentation skills, and the patience to explain free-licenses/Wikipedia... frequently. On-staff "champion" who supports the project officially from within the organisation. Clearly defined role for the project - not mixed with other social media/web management. The National Archives seeks applicants for a Wikipedian in Residence for Summer 2011. The Wikipedian in Residence is a student intern role. The Wikipedian in Residence will work as a community coordinator and strengthen the relationship between the Archives and the Wikipedian community through a range of activities. sharing the experience with the Wikipedian community and the public via videos, newsletter articles, or blog posts on our NARAtions blog or other blogs. Infographic with compiled data from July 2011. Published job offer through official recruitment process (e.g. NARA) [could add Chapter rep. to interview panel if necessary]. Timeline of Wikipedians in Residence up to 2012 (incomplete). 38 Science Museum and the Natural History Museum (joint post)  Wikipedia:GLAM/NHMandSM London, UK John Cummings March 2013 – June 2013, extended to January 2014. Rows in light blue are residences that are currently active. Concordia University Library Montreal, Quebec, Canada Website One year, beginning in the winter of 2019. Applications must be received by no later than Friday, February 15, 2019. Linked Data for Libraries, Stanford University Palo Alto, California LD4P2 WiR posting closed now? Meta-Wiki category, which contains some information about specific residencies, and also a record of grants from the Wikimedia Foundation that have helped fund specific residencies. Wikimedia Commons category, which contains photos, information graphics, PDF presentations, and other media resources. English Wikipedia's encyclopedia article about WiRs; these exist in several other languages as well (see WikiData link below). This Outreach Wiki's category of pages related to WiRs. The Wikidata entry for Wikipedians in Residence may contain additional links. The This Month in GLAM newsletter includes regular updates on many residencies. Wikipedians in Residence: Two Years of Open Culture, Open Knowledge Foundation blog, Lori Phillips. How Does a Wikipedian in Residence survive?, The GLAM-Wiki Experience, Àlex Hinojo. In-Residence Around the World, Wikimedia blog, Liam Wyatt.